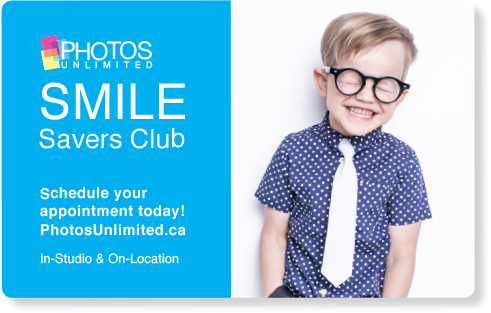 That’s right, we’re bringing back our Smile Savers Club. And we’re offering you even more savings and more reasons to SMILE. Buy more, Save more on In-Studio and On-Location purchases! Club membership is valid for one year from the date of joining. Offers valid on in-studio or On-Location sessions only, excludes reorders, prior sessions and online orders. Discount savings may be applied to digital bundles. Discounts do not apply to On-Location session fees, prepaid certificates or vouchers. Discounts may not be combined with any other offers or discounts. Limit one Free digital image per session. Purchase is required. $9.99 Passport Photos includes 2 passport photos in same pose. Program, prices, availability and terms subject to change without notice. Certain restrictions may apply. Void if copied or where prohibited by law.